One of my favourite analysts is Ed Easterling of Crestmont Research. We used to get together a whole lot more when he lived in Dallas, but he has since moved to the wilds of Oregon. Ed’s first book, Unexpected Returns, is a classic work that I think is a must-read for all stock market investors. And now he favours us with yet another book, called Probable Outcomes: Secular Stock Market Insights, in which he takes on the mostly silly research, done by so many analysts, that purports to show what an investor can expect to make from his retirement portfolio over time. I can’t tell you how disastrous this simplistic analysis can be for retirees. This week’s Outside the Box is an excerpt from this latest book. And now let’s turn to Ed’s insights. Al Pacino, Dionne Warwick, Fran Tarkenton, Jack Nicklaus, Mario Andretti, Peter Fonda, Raquel Welch, Ringo Starr, and Smokey Robinson—what do they have in common with secular stock market cycles? They were all born in 1940 and were subsequently impacted by secular bull markets. The choice of that year, which is not precise but was chosen for illustration, is that people born around 1940 aged into their forties by 1980. Most people and families accumulate savings slowly, if at all, during their twenties and thirties. By their forties, and certainly fifties, they begin to build retirement nest eggs. Therefore those born around 1940 had the opportunity to build sizable retirement savings during the 1980s and ’90s if they invested well as they reached their prime saving period. David Brinkley, Shelley Winters, Walter Matthau, and others born in 1920 were saving during the secular bear market of the 1960s and ’70s. With little stock market gain over that period, their savings would be filled with contributions that earned little additional investment income. That modest capital base, however, then encountered the secular bull market of the 1980s and ’90s, and though the nest was small, the eggs from it were abundant. This walk down memory lane illustrates several points. First, secular stock market cycles deliver returns in chunks, not streams. Second, most investors live long enough to have the relevant investment period extend across both secular bulls and secular bears. Third, investors do not get to pick which type of cycle comes first. Fourth, investors need to be aware that they will likely encounter both types of cycles. Those who experience secular bears during accumulation are generally better prepared than investors who are spoiled by a secular bull. A secular bull market is a pleasant surprise to retirees who endured a secular bear on the way to retirement. For retirees who grew to expect a secular bull during accumulation, the unexpected secular bear can be considerably disruptive. A retiree today has a relatively long-term horizon, with an average retirement age near 60 and an expected lifespan for the last surviving spouse of almost 30 years. Relatively healthy retirees today can expect one or both spouses to live well past 90. Whether you are retired now or on the cusp of retirement, your savings has been built over many years of toil and saving to provide or supplement your income during retirement. For pre-retirees who are still building the nest egg, this analysis can provide insights about what to expect in the future. The objective is to determine a safe assumption for investment returns, and a safe level of income or withdrawals from savings each year to sustain a desired lifestyle—the rate at which it is safe to withdraw golden eggs from the goose. 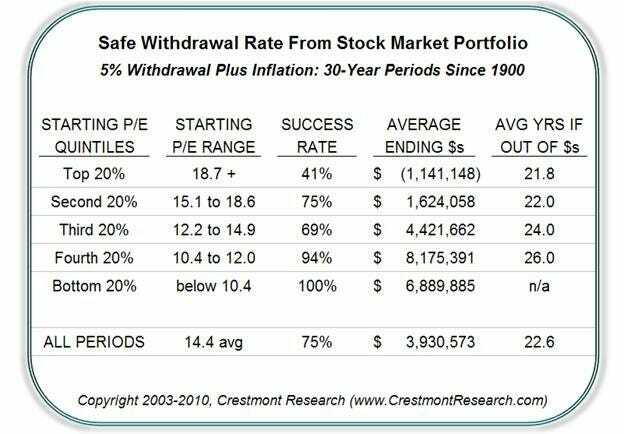 Safe Withdrawal Rate (SWR) is the term that investment advisors, financial planners, and do-it-yourself investors use to represent the acceptable rate at which funds can be withdrawn from an investment portfolio while still providing a high confidence of income for the balance of a retiree’s lifetime. In effect, this is the rate of withdrawal to avoid the ROOM, where you Run Out Of Money! SWR is often stated as the percentage of an investor’s initial portfolio that can be safely withdrawn annually after retirement to cover life’s expenses. The main variables are: (1) success rate, as reflected in the percentage likelihood of not running out of money; (2) portfolio mix and return assumptions for investment income; (3) how long the retiree assumes that he or she will live; and (4) a variety of other variables including tax rates, investment expenses, etc. Some advisors or planners will go so far as to advocate that today’s long-term retirees invest heavily in the stock market. Those pundits say, “A market that has never lost money over 30-year periods won’t let you down in the future.” It’s true that there has never been a 30-year period when stock market investors overall have lost money, yet there have been quite a few 30-year periods that have bankrupted senior citizens who were relying upon their stock portfolios for retirement income. Most analysts and models suggest that a retiree can withdraw 4% to 5% of the original balance each year, increased annually to cover inflation, and still have a very good chance of not running out of money. The models, however, often do not use reasonable assumptions and do not sufficiently consider risk. Generally, such high withdrawal rates relate to investment portfolios that are significantly weighted toward stocks, especially during the current and recent environment of low bond returns. For illustration, assume that a retired couple invests exclusively in the stock market because they “need” the extra return and should feel “safe” that the stock market will not let them down over a 30-year period. Further, assume no income taxes, investment fees, commissions, or other charges. Admittedly, these assumptions probably deliver the best-case scenario and conclusions. For the analysis, the portfolio includes a diversified stock market portfolio using the S&P 500 index including dividends. The time horizon is 30 years, which assumes that the last surviving spouse will need money for at least 30 years after the retirement date. What, therefore, are the chances of success, of not running out of money, and avoiding a job search after age 80? Many models use historical average rates of return. As previously reflected across multi-decade periods in the stock market, average rarely happens. Most often, returns from the market are either well above average or well below average. Regardless, as far as retirement success is concerned, each retiree’s results will be binary—the retiree either will be successful or will run out of money. It doesn’t matter whether the retiree—on average—has a 75% chance of success. The reality for each retiree is that success will be either 100% or 0%. Though probabilities are interesting, retirees should thus be keenly focused on the implications of the assumptions and their likely impact on the outcome. 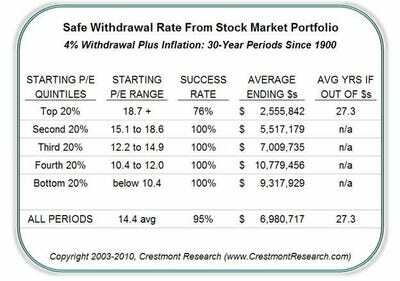 Using history since 1900 as the laboratory to assess the likelihood of success, a retiring couple who start with withdrawals of 4% have a 95% chance of success. In other words, they have a 95% chance of not running out of money before the last surviving spouse no longer needs withdrawals. For example, this represents an initial annual withdrawal of $40,000 for a retiree with $1 million, increasing the $40,000 at the start of each year by the inflation rate. By the way, about half of retirees will live past the expected average lifespan; thus the success rates are actually lower for the half of retirees in the lucky group. A 95% chance of success sounds pretty good—on average. The 95% success rate, however, means that you have a 1-in-20 chance of having to find a job at age 80. If you have enough money to be thinking about SWR, you likely have a lifestyle that you don’t want to compromise. When you think about last-to-survive issues, it has even greater significance. To further emphasise the concept of success rate, assume that the doctor comes into your hospital room and says that your upcoming surgery has a good success rate: a 95% chance of success. The doctor performs this procedure five times a day. Since that’s 20 per week, how many of you will immediately hope that you will not be the one that week who does not make it. A 95% success rate sounds good to all those who are standing around the operating table, but it is quite different for the one who is actually on the table. The patient will be thinking about his or her particular circumstances—whether the odds are more likely to be above or below the 95%. A high success rate may still represent a significant risk. Before digging into the details, what does the overall average look like? Over the 81 30-year periods since 1900, on average across all periods, the retiree who started with $1 million could have withdrawn 4% plus the inflation rate each year and still ended with $7.0 million. The average retiree accumulated seven times his initial savings, even after withdrawing 4% plus inflation every year for 30 years. As for the failure rate, only 4 of the 81 periods resulted in the retiree running out of money. What are the implications for investors, especially at this stage of a secular bear market? For retirees who are primarily invested in the stock market, the most significant factor determining future returns is the level of valuation at the time of initial investment, as measured by the P/E ratio. So the level of the P/E at retirement has a significant impact on the individual investor’s chances of success in retirement. To better understand the potential success rate for a couple entering retirement, stock market history can be dissected into five ranked sets called quintiles. These sets are organised from the highest to the lowest P/E ratio at the start of the respective 30-year periods. The result is that the highest quintile (the top 20% of all periods) includes the 30-year periods since 1900 that started with P/Es of 18.7 and higher. The second set (the next 20%) cuts off at a P/E of 15.1, the third at 12.2, the fourth at 10.4, and the last at 5.3. Why does this matter? While the success rate for the entire group was 95%, for a retiree who enters retirement with a portfolio dedicated to stocks when P/E is 18.7 or higher, the expected success rate based upon history is 76%—analogous to more than one loss per day for the surgeon, rather than one per week using the overall average. When P/E started at relatively high levels historically, thereby fundamentally positioning the stock market for below-average returns, there was a significant adverse impact on future success. 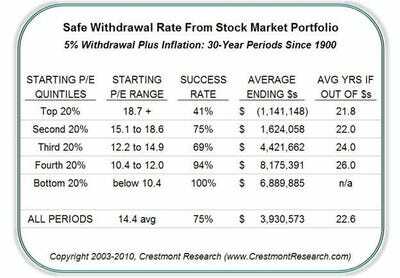 When P/E started at relatively lower levels, returns were always sufficient for 4% withdrawals—100% success from periods that started with a low P/E. As figure 11.2 reflects, the starting level of P/E has a direct impact on retirement success and on ending capital. The implication for today’s investor is that the likelihood of financial success in retirement is considerably less than most pundits advocate. 20 years from now, a response of “who knew?” won’t be much comfort for retirees in the employment line at the local job fair. This is especially true since a rational understanding of history and the drivers of longer-term stock market returns can help today’s retiree avoid that surprise. As presented in figure 11.2, covering the 81 30-year periods since 1900, the top 20% of the periods based upon the beginning P/E started with P/E at 18.7 or higher. Within that 20% of the periods, about 1 in 4 (24%) of the 30-year periods resulted in the retiree running out of money before the end of the period. When that occurred, the retiree was out of money on average during the 27th year and as early as the 23rd year. For those 76% who were fortunate enough to not run out of money, the average retiree that started with $1.0 million ended the 30 years with almost $2.8 million. Keep in mind that success provides a wide path, but failure is a thin line: those who succeed will end with a little or a lot; those who fail get to zero, or start counting pennies as their savings dwindle. Further, in reality, for retirees who invest during top quintile periods, the chance of suffering the painful effects of failure is even higher than 24%. Since a few of the periods ended relatively close to zero, fear forced some retirees to drastically reduce spending as their portfolios dwindled toward the end. For most retiree investors over the past century, those fortunate enough to have retired when stock valuations and P/Es were lower, the results were much better. As reflected in figure 11.2, the benefits were directly and inversely related to the starting level of valuation. As the starting valuation declines, returns increase, and the resulting average balance in the portfolio at the end of the 30 years increases. This is another tangible example of the way that starting valuation significantly impacts future results. 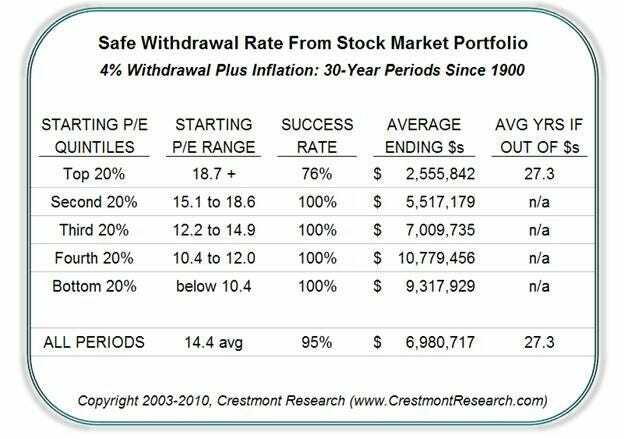 A number of advocates and studies promote initial withdrawal rates of 5% or more of the starting portfolio: “You can have $50,000 a year from your million dollars, and have it increase annually by inflation and still last 30 years.” The calculated success rate historically is 75% for retirees using a 5% initial withdrawal rate from stock market portfolio. For many retirees, that probability of success would be marginally acceptable. When the impact of starting P/E is included in the analysis, however, the odds change significantly for most of the quintiles. As figure 11.3 shows, though the average may have been 75%, one of the sets reflects success as low as 41% while another had everyone making it safely through the 30 years. As you reflect upon the figure to assess the likely odds of either financial success or failure during your retirement, it is crucial to recognise the importance and impact of the starting level of P/E. Most important, it does not matter how many of the scenarios provide your heirs with multimillions; you will likely be most concerned about reducing the chances of being forced to work again at 80. Risk management is not just about enhancing success; it is about avoiding the unacceptable failures. Though a statistical analysis of history provides averages across a wide variety of market conditions, the relevant periods for analysis are those with similar characteristics. Given the significant impact of P/E on returns, that factor will be a major driver for retirees over this decade and beyond. When individuals or couples retire with P/E in the upper quintiles, thereby driving below-average returns, their expected results will be below average. In some instances the risks will be so great that they may need to adjust their expectations, or they may need portfolio management to enhance potential success. Retirees during secular bear markets may be limited to withdrawal rates that are less than 3%, or in some scenarios as much as 4%, to sustain their desired lifestyle successfully throughout retirement. Retirees who want to withdraw 5% or more will need a more consistent and higher return profile for their investments than passive investments in the stock market or bond market can provide when starting valuations are high. For those retirees, it will require a more actively managed and value-added approach to their portfolios, including investments in the stock market, even then with no guarantees of success. There is no magic solution, no one way to achieve success. Given that retirees over this decade and longer are confronting the conditions of a secular bear market, it is important to start with a reasonable expectation about future returns and market conditions, then to apply appropriate investment strategies and approaches. Early personal planning and ongoing investment discipline can help toward avoiding the ROOM. Winston Churchill could have been talking about this decade in the stock market when he said, “Let our advance worrying become advance thinking and planning.” The practical implications of another secular bear market decade should be a call to action rather than a call for retreat. Churchill offers wisdom that acknowledges challenging conditions and provides a solution toward success. His advice encourages investors to seek the benefits of preparation and risk management, the essential elements for investing through this secular bear toward the next secular bull market.